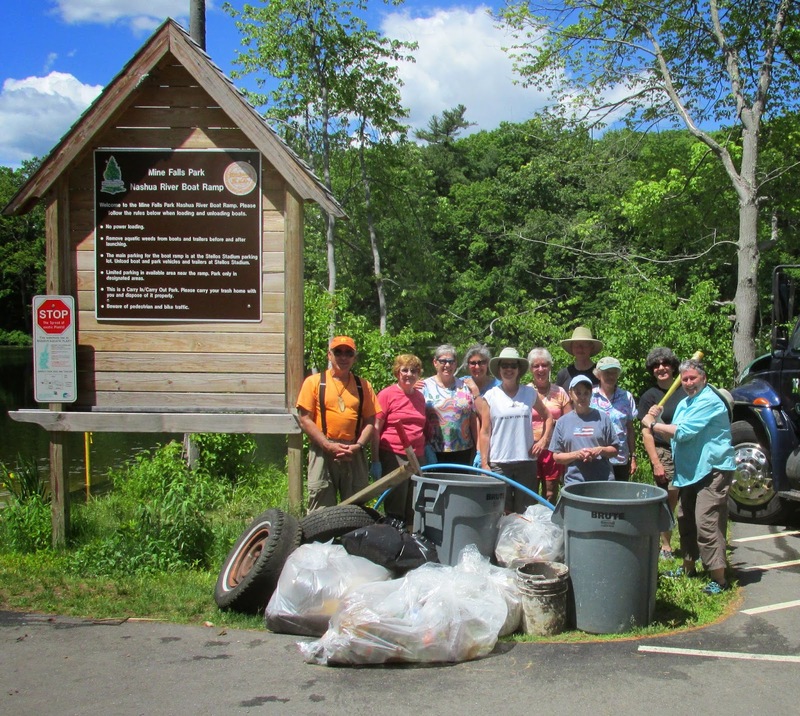 The New Hampshire Appalachian Mountain Club Paddlers held their second Trash Patrol of 2014 this morning at Mine Falls Park in Nashua, NH. The series of trash patrols are organized by club member Denise Hurt and held on the first Saturday of each month, May through October. Mrs. Trashpaddler and I joined with ten other trash paddlers in performing some custodial services to the Nashua River above Mine Falls Dam. Participants included: Denise (at bat in photo), Gene, Jennifer, John, Lynda, Marjorie, Maureen, Ruth, Sally and Sue. ...not a lot of tread left, but fortunately it'd been recently balanced. ...as some treetop occupants were being served an osprey brunch. At the conclusion of our trash patrol we paddlers enjoyed a nice lunch courtesy of D'Angelo Sandwich Shop in Merrimack, NH (thanks Lynda). Our efforts resulted in the removal of 278 recyclable containers and 104 pieces of miscellaneous rubbish that included a couch cushion, the aforementioned 4 tires, and pieces of wood and flotation. It was a truly splendid day and great to see Mine Falls Park being enjoyed by so many folks fishing, boating, and hiking. Next month's patrol will be on the Merrimack River (July 5th).